Rickettsia asiatica is a tick-borne pathogenic species borne by Ixodes ovatus. 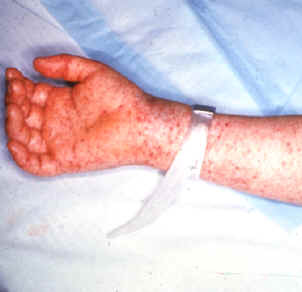 The type strain of Rickettsia asiatica sp. nov. is IO-1T. ↑ Rovery C, Brouqui P, Raoult D (2008). "Questions on Mediterranean Spotted Fever a Century after Its Discovery". Emerg Infect Dis. 14 (9): 1360–1367. doi:10.3201/eid1409.071133. PMC 2603122 . PMID 18760001. ↑ Parola, P; Paddock, CD; Raoult, D (2005). "Tick-Borne Rickettsioses around the World: Emerging Diseases Challenging Old Concepts". Clin Microbiol Rev. 18 (4): 719–756. doi:10.1128/CMR.18.4.719-756.2005. PMC 1265907 . PMID 16223955. ↑ Brumpt, E (1932). "Longevité du virus de la fièvre boutonneuse (Rickettsia conorii, n. sp.) chez la tique Rhipicephalus sanguineus". C. R. Soc. Biol. 110: 1119–1202. ↑ Conor, A & A Bruch (1910). "Une fièvre éruptive observée en Tunisie". Bull Soc Pathol Exot Filial. 8: 492–496. ↑ Ogata H, Audic S, Renesto-Audiffren P, et al. (September 2001). "Mechanisms of evolution in Rickettsia conorii and R. prowazekii". Science. 293 (5537): 2093–8. Bibcode:2001Sci...293.2093O. doi:10.1126/science.1061471. PMID 11557893. ↑ Zhu Y, Fournier PE, Eremeeva M, Raoult D (2005). "Proposal to create subspecies of Rickettsia conorii based on multi-locus sequence typing and an emended description of Rickettsia conorii". BMC Microbiol. 5: 11. doi:10.1186/1471-2180-5-11. PMC 1079849 . PMID 15766388. Fournier PE, Zhu Y, Ogata H, Raoult D (December 2004). "Use of Highly Variable Intergenic Spacer Sequences for Multispacer Typing of Rickettsia conorii Strains". J. Clin. Microbiol. 42 (12): 5757–66. doi:10.1128/JCM.42.12.5757-5766.2004. PMC 535242 . PMID 15583310. La Manna, Torina A, Agnone A (November 2013). "Detection of Natural Killer T Cells in Mice Infected with Rickettsia conorii". 60: 80–85. In computing, a Digital Object Identifier orDOI is a persistent identifier or handle used to uniquely identify objects, standardized by the International Organization for Standardization (ISO). An implementation of the Handle System, DOIs are in wide use mainly to identify academic, professional, and government information, such as journal articles, research reports and data sets, and official publications though they also have been used to identify other types of information resources, such as commercial videos.